REGISTRATION FOR THIS CONERENCE IS CLOSED. 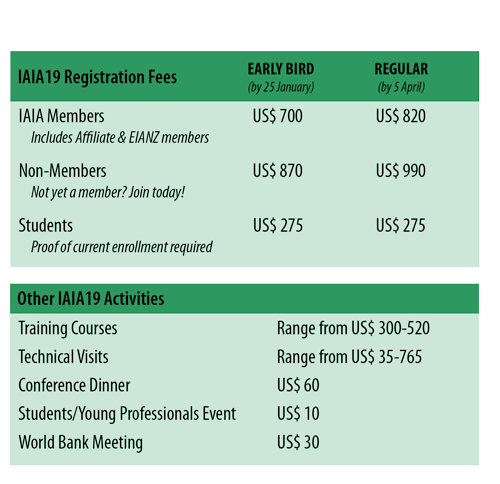 PRE-REGISTRATION AND PRE-PAYMENT BY 5 APRIL 2019 WAS REQUIRED TO PARTICIPATE IN IAIA19. ON-SITE REGISTRATIONS WILL NOT BE ACCEPTED. IAIA members enjoy discounted registration fees for IAIA events. Join IAIA now or renew your membership to take advantage of the member registration rate for IAIA19. Please note that the non-member registration rates for IAIA events no longer include a year of IAIA membership. All conference participants, including delegates, sessions chairs, invited speakers, organizers, exhibitors, and paper and poster presenters, are required to register and pay by the posted deadlines. IAIA does not have funds available to pay registration and/or travel expenses for program participants. Pre-registration and pre-payment by 5 April 2019 is required to participate in this event; cash payments on-site will not be accepted. Registrations will not be accepted after 5 April. If an invoice is required before issuing payment, you must request one via email. IAIA will refund registration fees upon written request received before 5 April 2019. A US$125 processing fee will be retained. After 5 April, no refunds will be issued for cancellations or no-shows. Substitutions for paid registrants may be made in writing without financial penalty. Refunds will be issued after the conference. Individuals officially identified by IAIA may photograph, videotape, and/or audiotape conference events. By attending the conference, you agree to allow your image to be used by IAIA. To foster sharing of information and open discussions, IAIA encourages presenters and panelists to speak freely and respectfully share their knowledge and experiences. During technical sessions, individuals are not permitted to record with personal audio or visual equipment or other recording devices such as cell phones, cameras, or recorders, without prior permission from IAIA and the speaker(s).